Chatting is easy, just choose your nickname, pick a channel and press go! You don't need to sign up for an account and you can use it from wherever you are with just a web browser. With Mibbit you can browse through and connect to channels or go straight to chat with people you already know. You can embed Youtube clips, use a pastebin, share the channel URL with friends and lots more. Signing up for an account gives you the option to control the way Mibbit works for you with a bunch of preferences for colours, smileys, and skins. 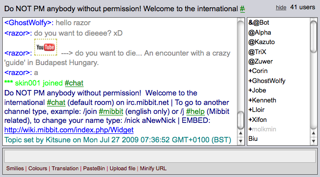 Mibbit chat runs on all PC and Mac browsers, and if you're not at a PC it also works on PS3, Wii and iPhone too! In three easy steps anyone can build their own chat room and use it on their site. We also provide an API and premium packages to suit feature requirements. Adding a chat component to your website will keep your visitors on your website longer, and keep them coming back, building up a real community.